The electronic parking brake replaces the handbrake. The electronic parking brake can be switched on at any time when the vehicle is stationary. Even when the ignition is switched off, always switch on the electronic parking brake when leaving or parking the vehicle. Pull and hold the button . The electronic parking brake is switched on when the indicator lamp in the button (arrow) and the red indicator lamp in the instrument cluster display are lit up . Press the button. At the same time depress the brake pedal with some force or depress the accelerator pedal slightly when the engine is running. The indicator lamp in the button (arrow) and the red indicator lamp in the instrument cluster will go out. The electronic parking brake switches off automatically when the vehicle pulls away, provided that the driver door is closed and the driver seat belt has been fastened. If the vehicle has a manual gearbox, you must also depress the clutch fully before pulling off so that the system detects that you want to switch off the parking brake. You can prevent the electronic parking brake from switching off automatically by pulling and holding the button while pulling away. If the driver door is open. The emergency braking function should only be used in those situations where the vehicle cannot be stopped using the foot brake ! Pull and hold the button to brake the vehicle sharply. An acoustic signal can be heard at the same time. To stop the braking procedure, release the button or depress the accelerator pedal. The incorrect use of the electronic parking brake can cause accidents and serious injuries. The electronic parking brake should never be used to brake the vehicle, except in emergencies. The braking distance is considerably longer as only the rear wheels are braked. Always use the foot brake. Never activate the accelerator from the engine compartment if a position or gear has been selected and the engine is running. The vehicle could move, even if the electronic parking brake is applied. In vehicles with a manual gearbox: when the clutch pedal is released and the accelerator pedal depressed at the same time, the electronic parking brake will be released automatically. 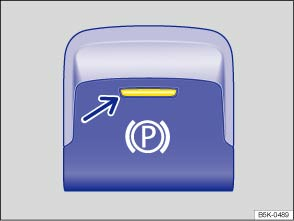 If the vehicle battery is flat it will not be possible to release the electronic parking brake. Use jump leads . Some noises may be heard when the electronic parking brake is switched on or off. If the electronic parking brake has not been used for a long period, the system will carry out occasional automatic and acoustic checks when the vehicle is parked.